Great, but a little odd. 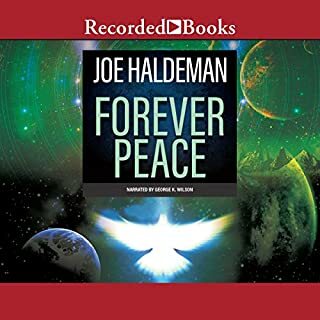 I’ve read reviews that are angry that Forever Peace isn’t a proper sequel to The Forever War, but advertising sometimes misleads. Forever Peace reads almost as if it’s set sometime during The Forever War. We know, at the end, humankind becomes Man. Forever Peace could be the first step humans took toward becoming Man. I kept the end of The Forever War in mind as I read and was satisfied with that assumption. My only real problem with the book itself is that it feels like two short novels were shoved together to make a book. On the one hand, you have the Jupiter Project and a cult that wants to make sure it continues. On the other, you have the humanization and pacification of the world. I think both would have been better stories on their own. In general, I really got to know and love the characters. Haldeman can usually do that to me and that’s why I have loved his writing for so long. I will probably add this book to my list that gets repeat listens.